Details are emerging about the three women who were killed by a patient who had been kicked out of their Northern California treatment program. 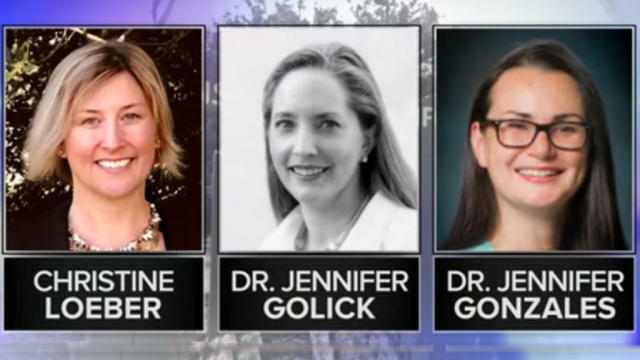 They were identified as The Pathway Home Executive Director Christine Loeber, 48; Clinical Director Jennifer Golick, 42; and Jennifer Gonzales, 29, a clinical psychologist with the San Francisco Department of Veterans Affairs Healthcare System. Jennifer Golick's father-in-law, Bob Golick, said in an interview that she had recently expelled Wong from the program. Golick was the top psychologist at the nonprofit home, which treats combat veterans of Iraq and Afghanistan. She called her husband, Mark, around 10:30 a.m. to say that she had been taken hostage, Bob Golick said. Mark Golick didn't hear from her again. Christine Loeber graduated from the University of New Hampshire and went into sales, then decided social work was her calling. She got her master's degree from Boston College in clinical social work and took a job with the Veterans Administration in Boston and then moved to the VA in Santa Rosa, California. She became executive director at Pathway 18 months ago. "She was delightful, intelligent, outgoing, charming," Woodford said Saturday morning as she stared across the veterans center grounds, where Pathway Home was still surrounded by police tape. "Very dedicated to the veterans." Her friend Tom Turner said Loeber, who was divorced, loved her work and was proud of it. Were she still alive, she'd be helping others understand and deal with the tragedy, Turner said. "She'd have a better perspective than I would," he said. "And she wouldn't be as angry I am." Friends and co-workers remembered Jennifer Gonzales, 29, as a "brilliant" psychologist who was committed to both her family and her job treating veterans with post-traumatic stress. Gonzales was seven months pregnant. She was married a year ago and was supposed to travel to Washington, D.C., with her husband this weekend to celebrate their anniversary, family friend Vasiti Ritova said. Ritova, whose niece cares for Gonzales' grandmother, said she would spend time caring for her grandmother and would visit her every other week. She said the loss was "devastating." "She was always singing to her grandma, giving her baths. She was always coming to look after her grandma - so that is how we come to know this sweet lady," she said. Marjorie Morrison, who founded the nonprofit group PsychArmor, said in addition to working with vets with PTSD, Gonzales also focused helping college campuses successfully reintegrate veterans when they return to school. Gonzales partnered with PsychArmor to create the VA Campus Toolkit, which PsychArmor put online. Many colleges use it, she said. "She was brilliant for being so young," Morrison said. "Absolutely brilliant." She added that PscyhArmor partners take on these projects without pay, which "says a lot about someone's character." According to her bio on PsychArmor, Gonzales received her Doctor of Psychology degree from Palo Alto University in 2003.